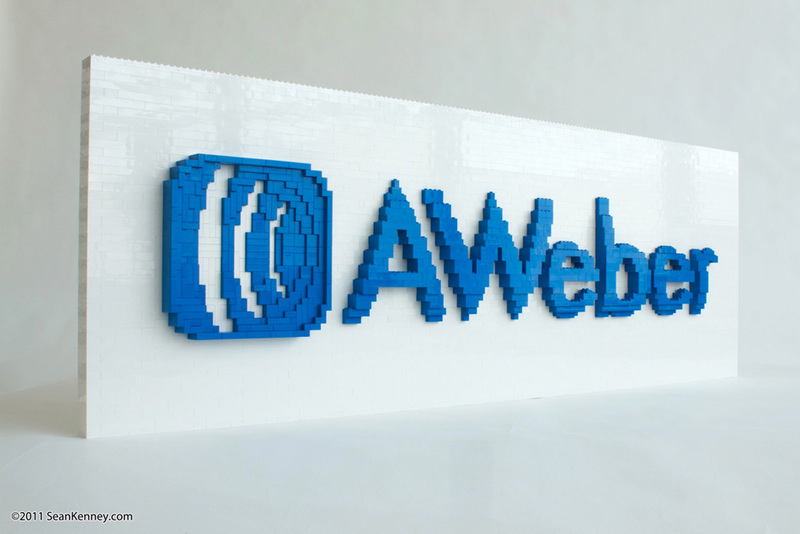 The folks at AWeber recently asked me to create a cool LEGO sculpture of their logo. I've created a lot of logos in the past, and while I usually do them as mosaics, the AWeber folks wanted something more visually impressive. Looking at the AWeber logo, I realized that, while it's just a simple set of blue letters, the logo itself is designed to look like light is hitting it in a certain way, and that the letters have a subtle, curved shape to them. So I decided to emulate those imaginary shapes in real life, so that light and shadow would affect the real-life blue letters the way they are simulated in the logo. So I designed the letters to extrude from a solid white slab, curve gently downward, and then cut back into the white slab. The large square swooshy part of the logo was also an interesting challenge. In the logo, it's designed to look like a concave, radar-dish-like shape. But the scale of the LEGO sculpture would only allow for 2 or 3 bricks of depth, and there wouldn't be enough space to get a good smooth curve in such a tight area. So as a result, I designed this part of the logo to be studs-out, getting you the higher detail level of thinner LEGO plates in the same area. The plates are capped off with tiles so that this section looks just like the letters. I had a lot of fun designing this sculpture, and it just goes to show that even a simple set of blue letters can provide a good creative challenge!